A study by the Berkeley, Calif., based Prevention Research Center of the Pacific Institute for Research and Evaluation finds that binge drinking among male college students is much worse than school officials, government researchers, and especially parents ever feared. Ten percent of the male students studied admitted to drinking 12 or more alcoholic beverages in a row, and “many” admitted to 24 or more in a row. “These are levels of drinking at which most men will have passed out or become comatose,” says study leader Paul Gruenewald. The study did not consider drinking by female students. (Reuters) …Right — girls are too smart for that. No need to study them. After a sophomore at Colorado State University in Fort Collins drank herself to death, her family lamented that it was just “one mistake” that killed her. Not so, point out reporters at the Denver Post. They found the personal web site for Samantha Spady, 19, where she posted photos of herself drinking with captions such as “I was drunk” and “Drunkass me.” Just before her death from a blood alcohol level of .43 percent, she posted “I’m also going to get extremely wasted this weekend.” A family spokesman points out Spady was a great student and a former DARE volunteer, but still insists her death was a “terrible accident” caused by “one mistake.” He admits the family had seen the web site, but hadn’t seen the multiple photos of her getting drunk. (Denver Post) …The real “one mistake,” then, is not opening their eyes. 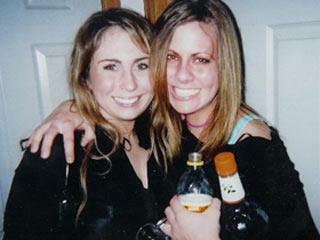 This is one of the photos that Samantha Spady (right, holding booze bottle) posted online. She titled this one “Big Sis and me.” Still think her family had no idea about her drinking? Yes, my observation is harsh — but it’s real. Again, True’s stories are not all meant to be funny. After Samantha Spady, 19, a student at Colorado State University in Ft. Collins, drank herself to death, the university banned beer sales at its football stadium. But university police say that drunken behavior at games is worse since the ban, not better, because students know they can’t buy beer there and arrive already drunk. Meanwhile, a company sponsoring a Jell-O wrestling tournament in Ft. Collins has canceled plans to donate $100 to a foundation Spady’s parents created in her memory. To attract women, promoter Brian Collins promised to provide free alcoholic “Jell-O shots” to the first 100 women who attended. Collins said there was “no harm intended” in tying the event to the Spady foundation. (AP, Denver Rocky Mountain News) …Harm, maybe not. Profiteering, yes. I was glad to see the article about the college student who died of alcohol poisoning. It’s too bad articles like this are not nationwide. Young people have no inkling of the dangers of excessive alcohol ingestion. More education needs to be done in this country about the dangers of alcohol and especially underage drinking. Congratulations on your stand in your tag line on this sad case of Alcohol overdose. I retired after working for 38 years as a police officer, and during that time it was obvious to me that the most critical error parents make regarding their children is to ‘excuse’ them for the dreadful mistakes that they make throughout their lives. The prime responsibility of parents is to ‘teach’ their children and sometimes that means being ‘critical’ of their actions, not offering excuses for their acting stupid. And that is not to say that they should not be forgiving when that is called for. It is a tough way to learn but I hope that your readers who have children have learned that it is essential that they let the children know that they will not be excused for stupidity and/or unlawful acts of any kind. My heart goes out to the parents of this young lady. I have no doubt that they dearly wish that they could have said or done something at some time in the past that would have made things turn out different. As a man who has watched my father, one of my brothers, my daughter’s brother-in-law and several other relatives and friends die from alcohol, no words can be harsh enough so long as they wake even one person to the horrors that alcohol can bring. It isn’t pretty to see someone you love die from something so foolish as overdrinking alcohol. Everyone believes it won’t be them, but my daughter seeing her godfather (my brother) die from alcohol scared her so much that she has never drunk alcohol in her life. Even at her wedding, while everyone else toasted with champagne, she drank ginger ale. I applaud your blunt and forceful presentation of that tragic story of a college student drinking herself to death. As an alcoholic who has been sober nearly 12 years, I cannot overemphasize the need for parents to confront their children about substance abuse — regardless of the child’s age. It may or may not have the desired effect, but at least the parents can have the solace of knowing they tried. Denial and enabling are deadly. Thank you for pointing it out. I know there are some who are saying you are callous. Let me say that sometimes being ‘kind’ and ‘nice’ and ‘gentle’ are what get people killed. I’m a recovering alcoholic, my parents were both active alcoholics. Denying what is in front of you is NOT LOVE. Looking at that web page and not seeing what was right in front of them was NOT LOVE. It was denial and it killed that girl. Period. When I was in college back in the 60s, I lived off campus and had a roommate named Joe. I quickly learned that I could not keep even the smallest amount of alcohol in the apartment as long as Joe was my roommate. He could not afford his own booze and simply could not resist tapping into mine! For this and several other reasons our roommate status lasted only a few months before I asked him to leave. He later dropped out of college without finishing. Several years later I was going through an old address book and found his phone number. I thought I would call him up just for fun and let bygones be bygones. A female answered the phone and I soon discovered that this woman was his soon to be ex-wife! It seems she had finally had enough of his drinking and all the associated grief that comes with it. I also learned during the conversation that Joe’s father had died a few months prior — drunk. It became clear then that Joe’s drinking problems went back many years. So in agreement with you, this was not ‘one mistake’. It was the ‘one mistake’ out of many that killed this girl. When will parents learn that alcohol can kill just as easily as a car or a weapon? People are so concerned about drug use (and they rightly should be), but turn a blind eye to alcohol. It’s a damn shame. This story should be posted in every PTA meeting, parent group, Sunday School, or any place parents will see it. This tragedy could have been prevented if they would just be honest with themselves and pay more attention to what their kids are doing. Please, parents with kids, even if your kid is perfect check it out, see what they are really doing, just be safe. They will love you for it later on. Talk to them, not at them, and you will learn sooooo very much. Too many of our kids are dying from alcohol and many more are destroying their futures, because you parents just don’t want to see what is going on. Thanks for printing the article. It marks a change for the press to paint a negative picture of the death of a young person. Whenever I read or hear about a death — road accident, murder, suicide, whatever — the young person seems to always be well-loved, of a cheerful disposition, hard-working at school, and so on. For the press to point out that in reality the sophomore drank herself stupid all the time — something that the family were oblivious to — is refreshing. I hope that when my daughter (also called Samantha) is old enough to be at college I can recall this sad event and remember to keep my eyes open. The response to your tagline, that it was callous, is exactly the reason the problem exists; excusing complicity through condolences. Reminds me of the same mindset expressed in stories about England during the White Slavery epidemic some 150 years ago in which women were kidnapped and sold on the international market. Parliamentary solutions were impossible since such subjects were not discussed in Proper Society. Still, my own response is even more callous. I’ve drank like a fish; one night determined to keep count by keeping my stir sticks. Too bad the waitress cleaned them up while I was away from the table. So I lost count after 23 shots of 86 proof booze. I’ve tried illegal drugs that have killed others in just one attempt. I’ve been shot, stabbed, knifed, sliced, taken hostage, kept prisoner, beat up, tortured, and God himself has sent down three heart attacks at me, and I’m STILL alive. Better people than I have died from fewer mistakes. And there is my point. If I, in my advanced age, have little fear of the consequences of my actions, one can understand the young person’s belief in immortality. Most will ignore all the warning stories since “it can’t happen to them.” But there will still be a few to benefit from those warnings, and it just may save their lives. So, rather than criticize someone for attempting to save a life by cold, harsh facts, remember that there are even MORE callous people who figure that everyone is going to die eventually. Some of us are just luckier than others. Good story, and good tagline, Randy. And I’m reminded of the expression, while you may only be one person in the world, you may well be the world to one person who listens. Thanks for pointing out that attempts at prohibition usually have the unintended consequence of stimulating binging. A bunch of University Presidents tried to get the drinking age lowered for just this reason. They failed. Perhaps in another decade the nation will grow up a bit more. Do we know for sure that the person identified as “Big Sis” is really Ms. Spady’s sister? It may just as well be a sorority sister or simply a close friend, in which case it is plausible that her real family was indeed unaware of her drinking habits. This is not to say, of course, that lack of awareness is acceptable. As this story illustrates, unawareness and denial can have very tragic consequences. In the mid-1980s I was a single father raising a teenager son. One day, I noticed that a bottle of liquor which had been quite full was now nearly empty. My son admitted that he and some friends had consumed the liquor after school. Maybe so, but kids can also have alcohol problems.